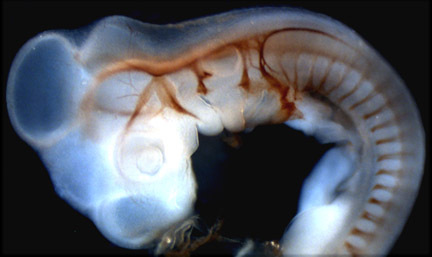 A fundamental question in neuroscience concerns the mechanisms by which the complexity and precision of connections between cells in the nervous system is achieved. At the cellular level, this process requires the navigation of axonal processes to their appropriate target cells, the formation of synaptic contacts with postsynaptic partners and the assembly of functional synapses, specialized structures that allow the fast transmission of information. 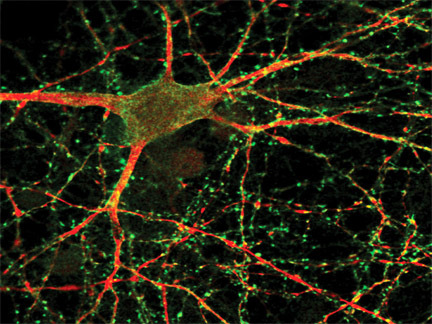 Below, Synapses (green) of hippocampal neurons cultured in vitro. (1) to dissect signalling mechanisms that control the dynamic reorganisation of the cytoskeleton within the growth cone and at the synapse; (2) to understand how different members of the Semaphorin family of axon guidance molecules effect neuronal circuit formation; (3) investigate the temporal and spatial aspect of neuronal signaling by the use of high-resolution live cell imaging. We believe that our research into the signalling mechanisms that control the dynamic reorganisation of the cytoskeleton within the growth cone and at the synapse has – in general - potentially direct implications for developing and validating pharmacological therapeutics for the treatment of various neurological disorders. The Eickholt Lab is part of the The NeuroCure Cluster of Excellence at the Charité – Universitätsmedizin Berlin.